Summer is finally here and what better way to enjoy it than in an oasis in your backyard. 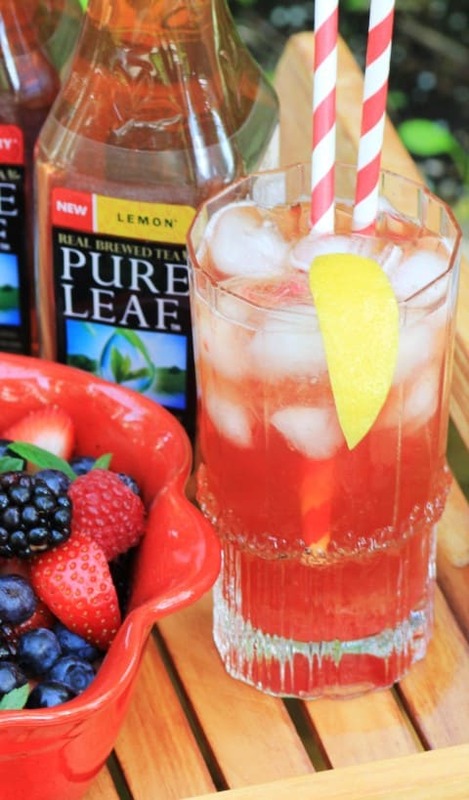 Get out with family and friends and try these wonderful Pure Leaf Iced Tea inspired recipes at your next gathering. Pure Leaf Ice Tea is not only super refreshing on a hot day but it is also real brewed tea with a fresh brewed taste!! It is made with the finest of ingredients to give you an ice tea that flies above them all. It was so easy to work with this delicious iced tea. First off I wanted to make a mocktail, one that was not only inspired by the iced tea itself but also my backyard. I chose the raspberry ice tea and paired it up with a raspberry rhubarb compote and a splash of 7-UP, rhubarb taken right from our backyard. Wow, this mocktail will blow your socks off. My family loved it!! Add all ingredientsfor the compote into a medium pot, stir and bring to a boil. Reduce to simmer and continue to cook until thickened and all the fruit has broken down. Set aside to cool and then refrigerate. To make the mocktail, add ice to a tall glass. Place one rounded tablespoon of the compote over the ice. 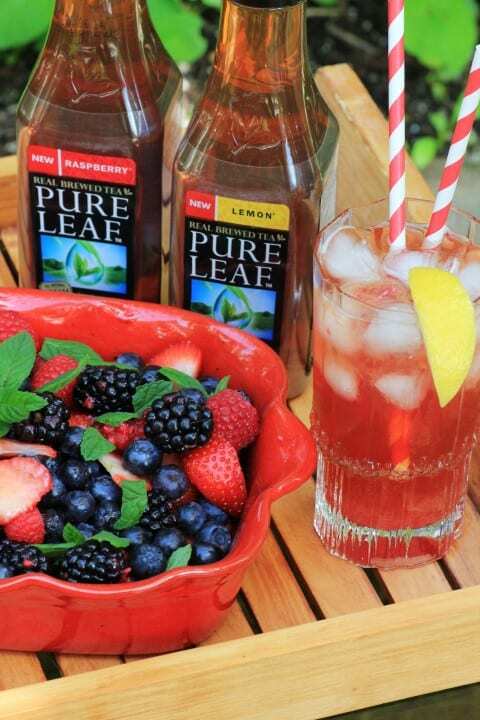 Fill the glass to ¾ full with Pure Leaf Raspberry Iced Tea. Top with 7-Up. Serve with a lemon wedge if you like. I love entertaining but I hate being tied to the kitchen when my company is here. I love great make ahead recipes and this is one of them. I have seen this around with an Italian twist to it also. I went this time with fresh wonderful French ingredients and tied all the ingredients together with a delectable homemade and very easy Raspberry vinaigrette. *Note: While the compote was cooking I also added a cup of the Raspberry Iced Tea to a small pot and brought it up to boiling and reduced it to 2 Tbsp. This will be added to my next two recipes!! 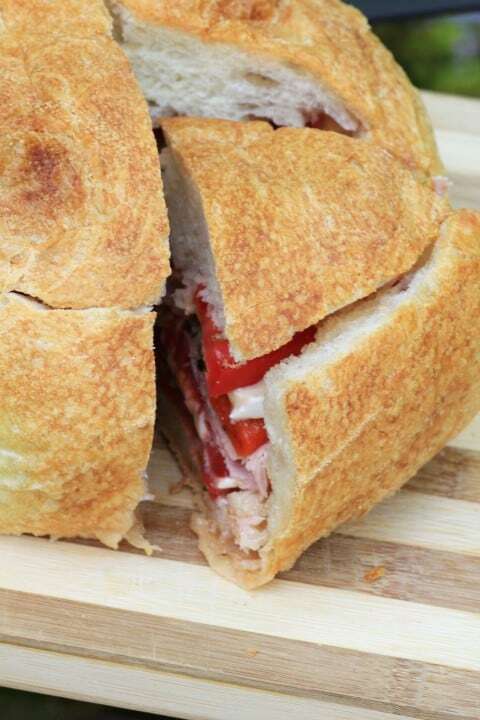 An amazing sandwich that is perfect for company or a picnic!! The amount of ingredients you need will depend entirely on the size of the loaf of bread. Black Forest Ham, I used about a 150 g.
To assemble sandwich, cut the top off of the loaf and remove most of the bread inside the loaf to make a bowl. Save for another use like bread crumbs if you wish. Brush the inside of the loaf with good quality olive oil. Salt and pepper the bread lightly. Start to layer in the ingredients. First a layer of roasted red peppers, then red onions, basil, 3 tsp. raspberry vinaigrette, salt and pepper if desired, brie, tomatoes, red onion, basil, 3 tsp. raspberry vinaigrette, salt and pepper if desired, ham, red peppers, red onion, basil, 3 tsp. raspberry vinaigrette, salt and pepper if desired, brie, tomatoes, salt and pepper. Place the lid back on the loaf and wrap very well in plastic wrap. Top the loaf with a brick wrapped in foil and refrigerate for at least 2 hours or overnight. If taking on a picnic it is best to cut on site, so take a board and large bread knife with you. Hubby said that not to let my head swell but this was the best sandwich he had ever had!! We all need dessert, even on a picnic or at home!! This simple and delicious fruit salad will fit the bill nicely. 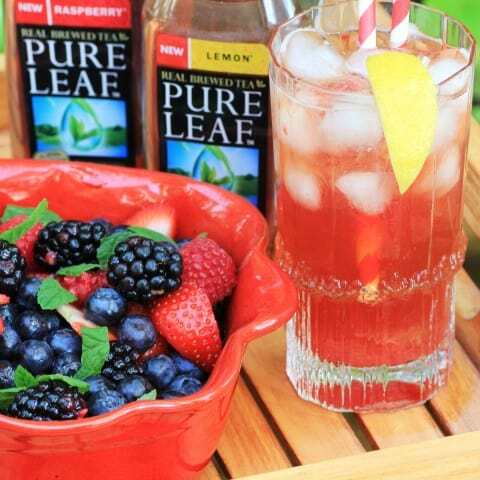 Adding a tablespoon of the reduced Pure Leaf Iced Tea to the fruit salad adds a little sweetness and a whole lot of amazing flavor. It paired up so lovely with the fresh mint from our garden, making this fruit salad extra special. Fresh berries make a perfect dessert for any picnic!! Mix the fresh berries together and before serving drizzle with the reduced iced tea and top with fresh mint leaves, serve!! 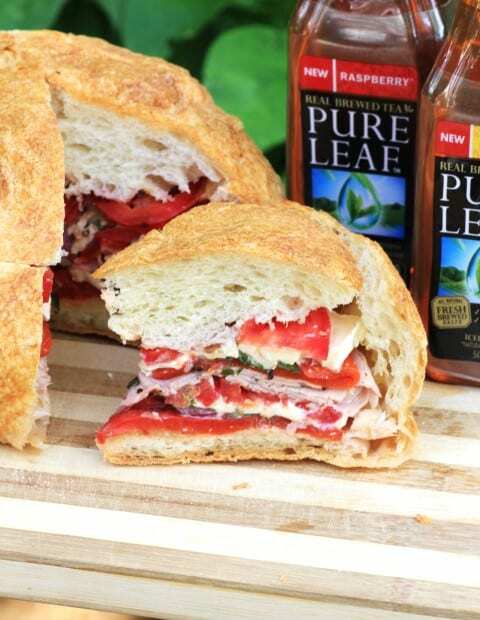 Enjoy these recipes in your backyard this summer with Pure Leaf Iced Tea or take them in a picnic basket and love the outdoors in your city!! 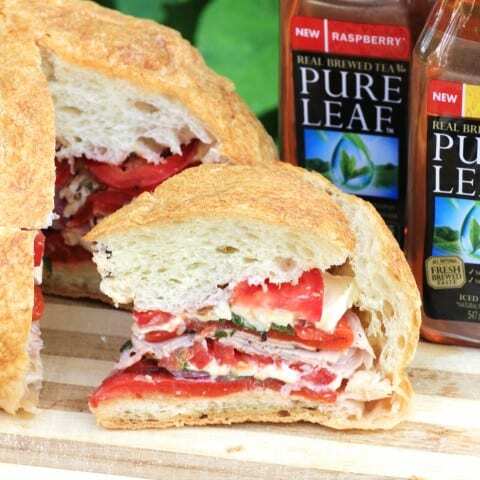 Pure Leaf Iced Tea sounds wonderful. Love the recipe ideas! All of this looks and sounds so lovely. The iced tea looks so refreshing. I am SO EXCITED to have a fresh brewed iced tea available for on the go! These recipes sound fabulous Tara. Tara, I really love the sound of your raspberry rhubarb iced tea fizz! I’ve never tried Pure Leaf before but will keep an eye out for it next we do our grocery shop. Sounds fab! Great recipes!!!! I absolutely love Pure Leaf Iced Tea! Tara, great looking drinks with a great looking sandwich! I love Pure Leaf Tea. I can’t wait to give that mocktail a try, it sounds refreshing!! Tara, I LOVE what you did with your recipes! Everything looks delicious and sounds amazing. I’m definitely going to try these out. What a great summertime meal! OMgoodness. I can’t believe what you did with tea! wow. What a wonderful menu. Wish I was there enjoying it! Oh the tea mock tail sounds great. I really want to try. Looks like a perfect choice with the sandwich and salad. Thank you so much Sherry, it was fun to make! !